I have been sitting on this collection of polishes for a month or two, and I'm finally glad to be able to share my swatches with you, as well as some nail art. First lets look at the nail I wore. 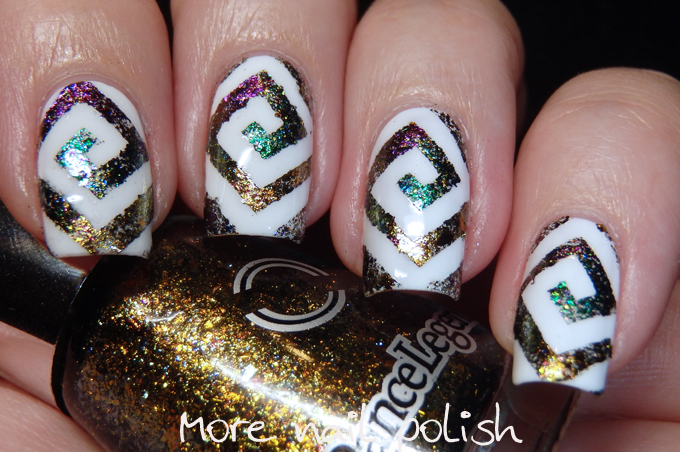 I used some square swirl nail vinyls over white polish and applied each of the polishes in a circular motion. 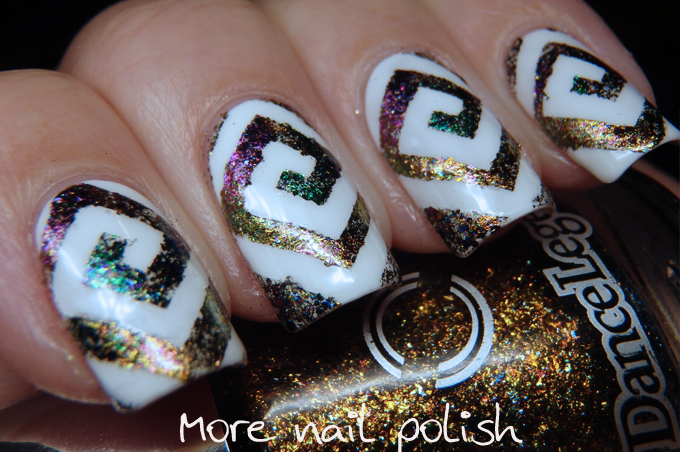 Not only do many of these polish change colour on different angles because of their multichrome goodness, but when you apply them in this sort of patter it make it look like there are even more colours. Now let's look at my swatches. 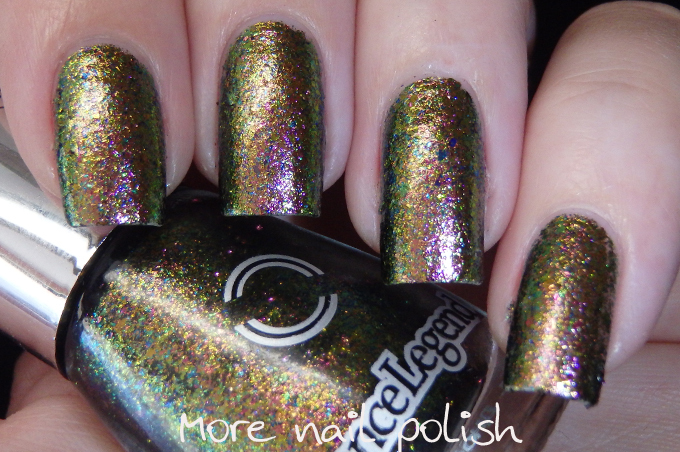 I have the six multichrome flakies from the Mystery Collection here, but there are also six more metallic shades that really remind me of the China Glaze Bohemian collection from a few years back. 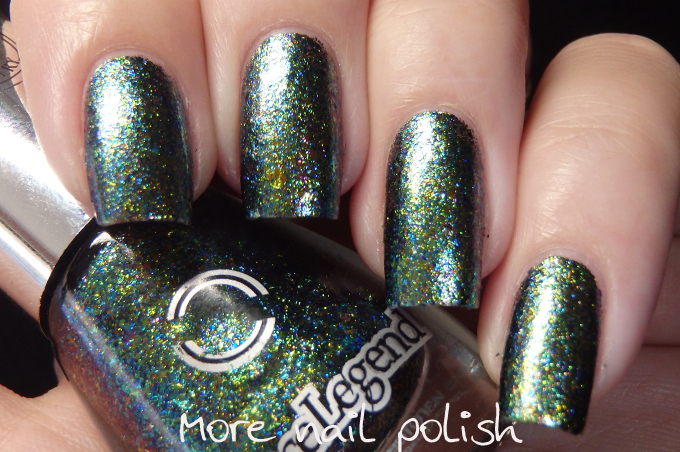 These polishes come in the smaller Dance Legend bottles, but I was very happy to see that they are packed full of the multichrome flakies. 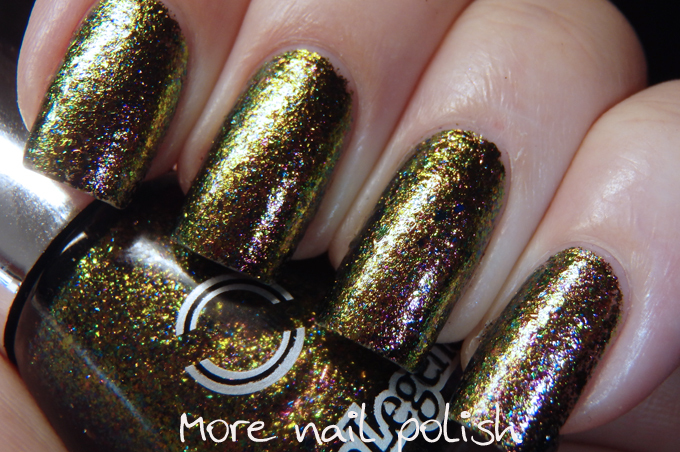 Unlike other brands of multichrome flakes that you have to sponge on to achieve full coverage, you can easily achieve coverage with three thin coats. All the swatches show three coats with Seche Vite top coat. 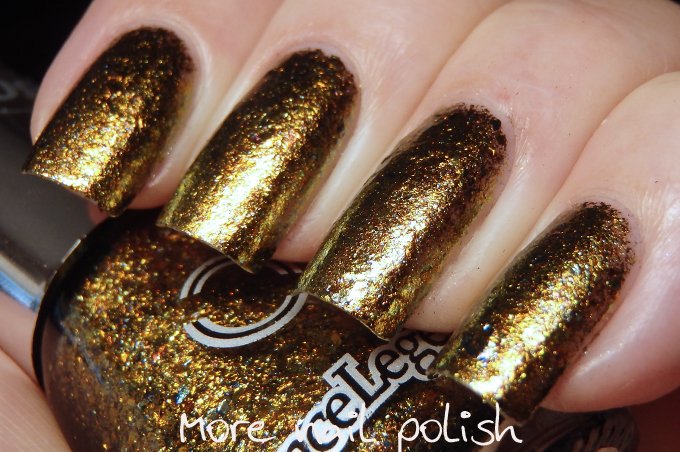 Firewalker - a warm toned gold with platinum and gold flakies. This one has the least amount of duochrome colour shifting. 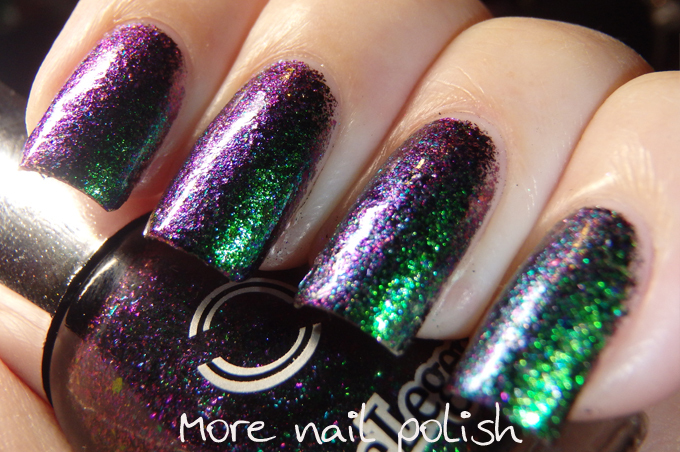 Hell Money - a strong green to purple multichrome flakie. Invocation - this one is mostly made up of gold, green and blue flakies, some of those flakies have a stronger colour shift than others. The overall appearance is a mossy olive green. 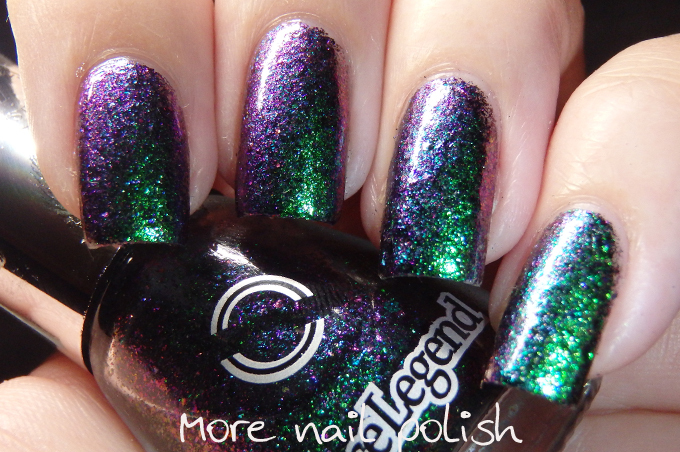 Supernatural - another of the strong colour shifters. This one goes from indigo blue to purple, but there are also a few other coloured flakies in there, with some green and gold too. The overall appearance is a metallic purple. 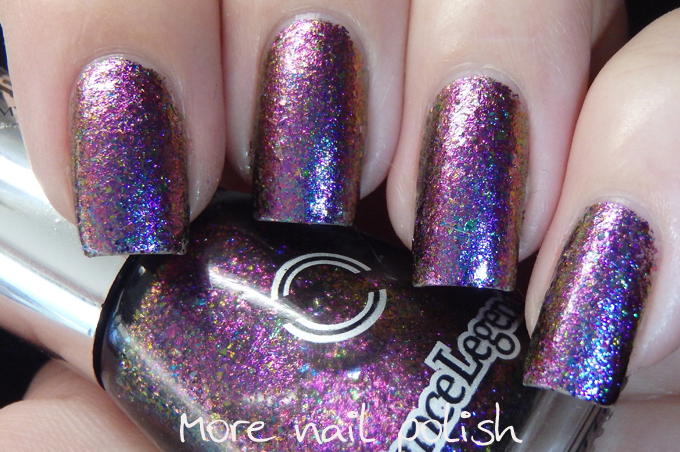 Unrequited - This one has a mix of pink and gold flakies, as well as a few scattered blue ones. The overall appearance is a rose tinted copper that also glows green. Overall I think it's a great collection. 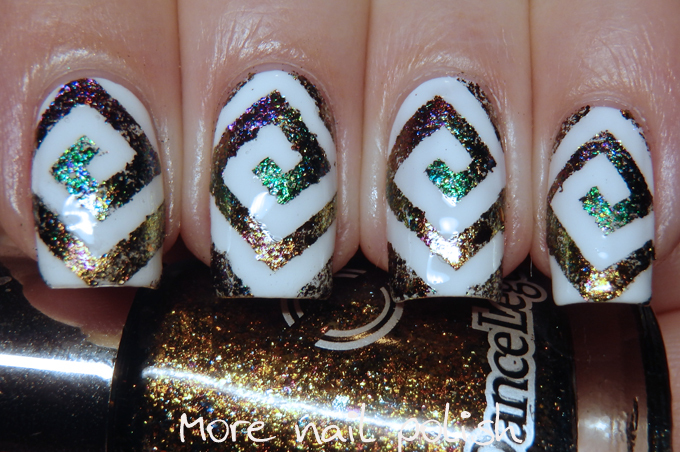 I love that you can just apply them like regular polish and get full coverage at three coats. 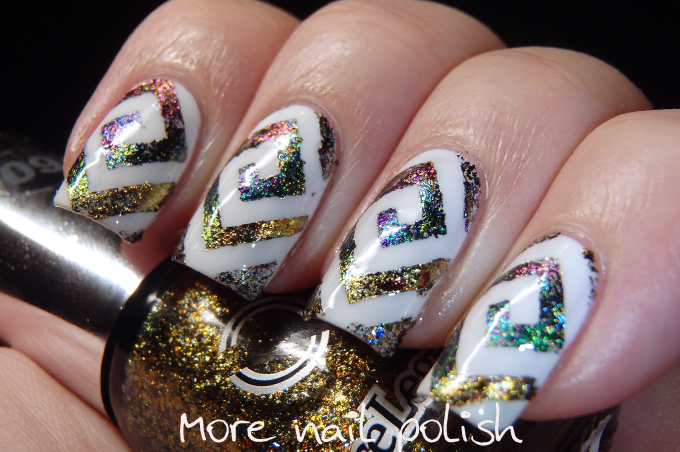 This means of course you can also layer them over a base colour, that way you wont waste the precious polish in the little bottles.